A European film lab – settled in Brittany – that accompanies authors of fiction during their writing process, Le Groupe Ouest lies at the crossroads where the needs of authors and institutions of a growing number of countries intersect. From not only the four corners of Europe, but also from the Indian, African or Middle East subcontinents, convergent requests come to Le Groupe Ouest: How to guide the new generation of writers? How to best help them give birth to their intentions through narrative means? « The creation of stories entails fundamental stakes: artistic, of course, but also anthropological, social, political and prospective. The function of stories is to bring communities together through visions, emotions or imaginary shared constructions. Today, movies, series and – globally – the entire body of stories propelled by moving images, have become the breath of the representations and projections of our societies. For better, yet sometimes for worst: For the last twenty-or-so years, the degradation and the worldwide, massive exportation of a certain type of Hollywoodian creations particularly appreciated by the young generations – films made for the box-office that enhance arms, brutality, violence and super heroes – are problematic for the entire planet today. Almost as if we were facing a sort of chronic failure of our capacity to dream together, to open other horizons, other models for the new generations. That being said, the strength of Europe lies in its own particular features, which are far-too-quickly considered as banal: multiculturalism, secularism, the singularity of real-life individual experiences, the integration of social criticism in individual stories. In Europe since the Enlightenment, the field sheathed with the fabrication of storytelling combines a variety of motives, a wealth of nuances and a unique worldwide power of questioning. Thus, it seems to us that the revival of “making a story”, taking in consideration a constructive and open vision on the new methods, becomes an absolutely necessary lever in the manufacture of meaning, and at the same time a humanist tool of “soft power” in a world that is losing its sense of direction. The stake in the making of these stories that can heighten the awareness of non-violence, and the need for contemporary stories that trace all possible diagonals and collective representations that they federate, thus becomes crucial. This is why we are launching the StoryTANK. We hope to bring together seasoned writers of screenplays and fiction, stemming from the best international cinematography, and allow them a prospective and pragmatic work process with researchers in adjacent fields of storytelling (cognitive, social sciences, physiology…). It’s about cogitating together, in a non-dogmatic, European and humanist perspective, about the function – both physiological and social – of the story using images and sound, keeping in mind the new methods of a generation transformed by the digital revolution. 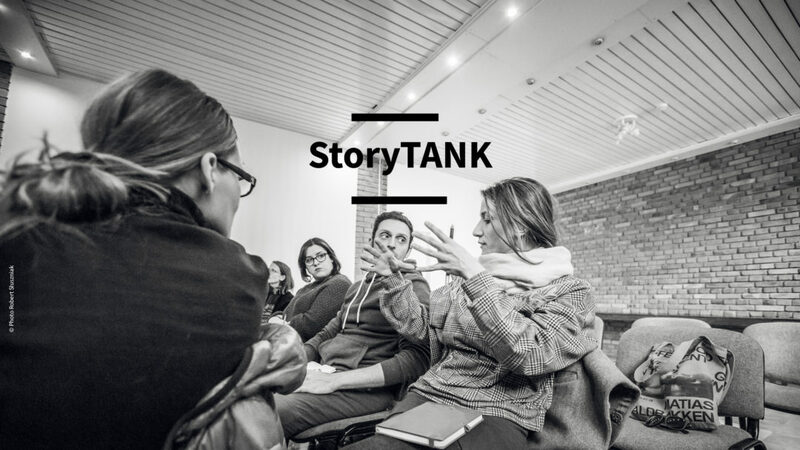 April 9th 2019, the StoryTANK is launched in partnership with the Prix du Scénario (Screenplay award – ex- Sopadin), the CNC (French National Centre for Cinema and the Moving Image), the ARP (French Guild of Authors, Directors and Producers), Creative Europe – MEDIA programme and the Film Français magazine, as well as the European programme LIM | Less is More, Control N and TIFF in Romania, VAF in Flanders, KBF in Poland, LFC in Lithuania, NFI in Norway and, the Film Agency of the Republic of North Macedonia. This launch will be made in the presence of representatives of numerous European organisations such as ACE Producers based in Amsterdam, the TorinoFilmLab in Italy, or MidPoint, in the Czech Republic. 1. Well-aimed research workshops mustering seasoned screenwriters and authors, collating with researchers in adjacent domains who were chosen for their potential contributions in the areas of elaboration and/or perception of the story. Each workshop will engender publications about the broached subjects as well as the most enlightening aspects of the exchanges. The object here is to open new perspectives or understanding of the spheres in question, with the intention of clarifying the authors’ and their collaborators’ works. 2. At the outcome of each workshop, the screenwriters and/or researchers who distinguish themselves on the deciphered subjects will take part in public interviews or filmed master classes, which will be broadcasted on a free-access YouTube channel on Internet. 3. In prestigious international festivals, the THINK TANK will organise round tables or master classes, both open to the public.